Before i go into how a low delivery percentage can be a good screener to understand high risk stocks or speculative built up , circular trading and so on lets look into what it means. Let us understand it through an example. 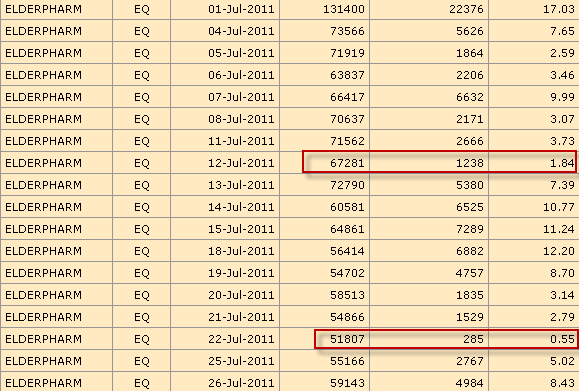 This implies out of 3 lakh shares only 30k shares or roughly 11% of the traded quantity was marked for delivery. This shows that majority of the trades were squared of in the day. There could be a slight variance if there is short delivery but its miniscule number. 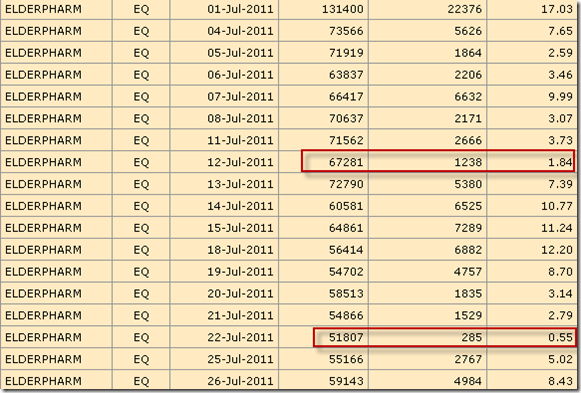 You can see the percentage on www.bseindia.com and www.nseindia.com if you look into the get quote as well as in archives section you can see deliverable quantity to traded quantity for a very long span of time. 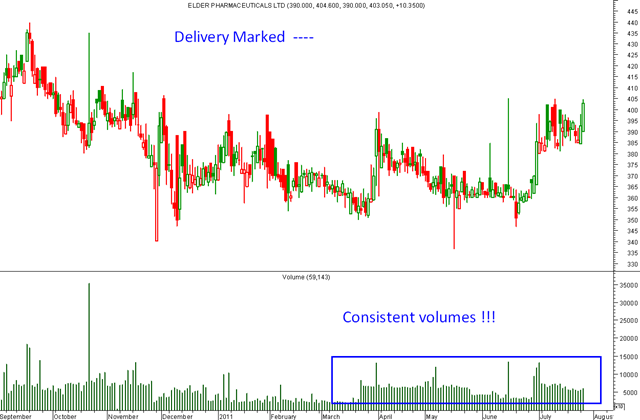 The thumb rule says Higher Delivery marked with higher volumes and a price rise indicates bullishness and vice-versa. But one of the major thumb rule is very low Delivery percentage is what is a strong red signal at times. Let us look into examples which will give us a better insights. The stock chart looks exciting but what surprised me is even though the stock has moved up and down but volumes have been consistent. The stock on certain days saw only 1-2% of the total traded quantity being marked for delivery. Everyone knows this stock is not a traders favorite so who has been trading the stock intra day. Possible questions – Circular Trading, Managed ? 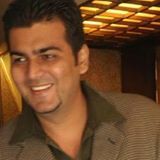 Will post few more examples in the next post. Readers can also suggest such stocks. Previously had posted similar articles on Ushdev International and Jaybharat textiles and Real Estate which later got into the SEBI net. Very good article reflecting on a important parameter on manipulated stocks. This is quite an eye opener.Thanks very much. I have one question though. 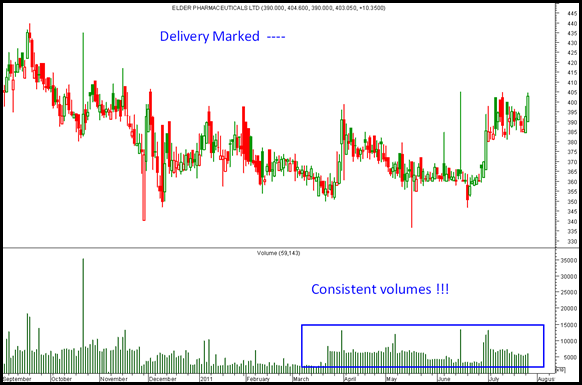 OBV takes into care positive and negative price action with volumes. SEE FLEX FOOD IT IS A SMALL SORRY MICROCAP COMPANEY. IT IS IN FMCG(FOOD) ITS TRYING TO BREAK OUT ABOVE 36 . ITS A REGULAR DIVIDENT PAYING COMPANEY, HAVING YELD AT THE CURRENT PRICE ABOUT 6%. KINDLY RESERCH TIHS STOCK THANKS. Will have a look on to it.